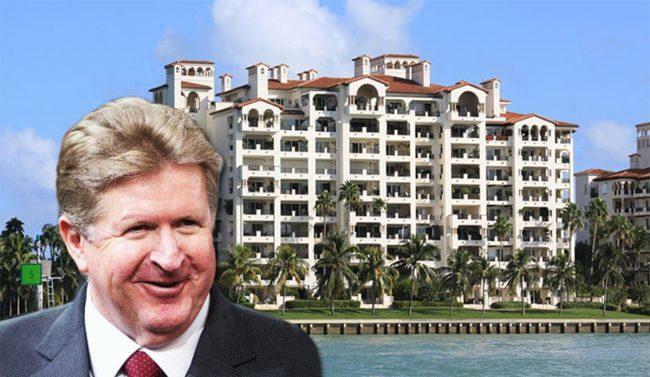 UPDATED Sept. 6th, 10:50 a.m.: Mexican billionaire German Larrea just paid $21 million for three condos in Fisher Island. Property records show Larrea bought units 4812A, 4811C and 4821C at Bayview at Fisher Island through the entity Antarctica International. The company is led by Luis Castelazo, who runs Larrea’s family’s holding company, Empresarios Industriales S.A. de C.V.
Larrea’s wealth comes from his family’s mining and rail company, Grupo México, which acquired Florida East Coast Railway in December for $2.1 billion. Forbes pegs the family’s net worth at about $16.4 billion. Grazyna Kulczyk, a prominent art collector and one of Poland’s richest women, sold unit 4812A for about $6.44 million. The three-bedroom, 3,550-square-foot unit traded hands for about $1,800 per square foot. Records show it last traded for $3.8 million in 2008. The last two condos were sold by Elevest N.V., an offshore company based in Curaçao and led by Evert Rakers, a managing director at the international financial services company TMF Group. Each unit has four bedrooms and spans about 4,000 square feet. Records show Elevest N.V. bought unit 4811C in 2001 for $3.25 million and unit 4821C in 2008 for $5.7 million. The company owns at least two other Fisher Island condos at the Marina Village building. Viola and Adam Kruszelnick with One Sotheby’s International Realty represented the seller. A number of Mexican investors have turned to South Florida real estate over the past year ahead of the presidential election that took place in July. According to the Miami Association of Realtors, Mexicans purchased $284 million worth of South Florida homes last year, representing about 4 percent of all foreign investment in the region in 2017. José Antonio Cañedo White, a founding partner at Mexico’s Axis Capital Management recently sold his Oceanside Fisher Island ground-floor suite for $12 million. Larrea, too, is no stranger to Fisher Island. He was previously under contract to buy two units at Palazzo Del Mare, which eventually led to a legal dispute with Fisher Island Holdings. Larrea took the company to court to get his 10 percent deposit back after the developer refused to pay for his request to combine the two units. An earlier version of this story incorrectly stated that Larrea was involved in a legal dispute with developer Heinrich Von Hanau.